Dennis Kunkle, Director of Facilities at the York County Heritage Trust , was last night's speaker at our woodworking club meeting. Dennis made a replica of the 19th c. grease box on display at the Historical Society of York County and brought step-by-step examples of the building process. Grease boxes, he surmises, may have been used by mechanics to lubricate machinery. His contains beeswax instead of grease, which he uses to lubricate screws. Needless to say, my love of boxes was roused and I plan to build my own someday. 1. Layout the rough shape on a block of wood. Dennis suggested using a nice piece of figured walnut. 2. Rough cut the shape with your tool of choice. 3. Saw the lid off. 4. Clean it up with a shoulder plane so it's seated perfectly when closed. Remove saw marks made within the kerf by laying a sheet of sandpaper on a flat surface and scrubbing the workpiece clean. 5. Lay the lid in place and realign the grain. Because of the kerf, the lid will sit lower that the top surface of the box, so you may need to reposition the lid slightly in order for the grain to match. 6. Drill, countersink, and screw the lid to the box. 7. Plane the top of the box flush with the lid. 8. Inlay a decorative diamond or other shape on the lid. 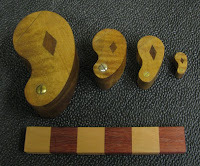 Dennis cut the inlay piece first (curly maple) and cleaned up the edges on sandpaper that was laid on a flat surface. Rub the piece's edges on the sandpaper at a very slight angle to create a bevel. 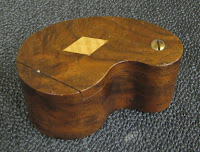 Trace the outline of the inlay piece onto the lid and use a chisel to remove the waste. Glue the inlay piece in the recess. Pl ane flush. 10. Trace the box outline onto the workpiece. 11. Cut the shape with your tool of choice. Dennis used a bandsaw. 12. Clean up the rough edges with your method of choice. Dennis sprayed Deft as a finish and did not finish the inside. He melted beeswax and poured it into the cavity. 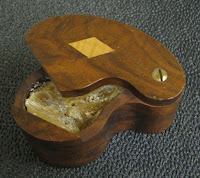 He also brought to the presentation a set of matryoshka grease boxes, the smallest of which was approximately 3/4" long, complete with inlaid diamond. It's a neat little project—one that can be made in a few hours and still has a useful place in the shop. I was not able to find any historical informat ion about grease boxes, so if you have any info, please feel free to share. Final dimensions of the grease box are approx. 4.25" long x 2.25" high.